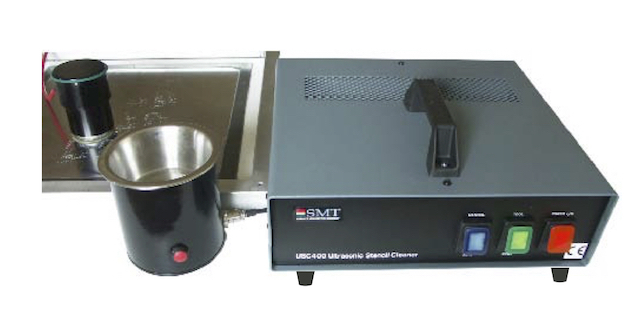 The SMT USC400 is a highly portable ultrasonic contact type stencil cleaning system. The system excels in removing difficult high tack residues such as those found with lead free solder materials. Direct contact ultrasonic cleaning is the most effective way to remove lead free solder paste residues from fine pitch stencils. The SMT USC400 is suitable for both offline and on printer cleaning operations. Stencil cleaning can be carried out on the printer without removing the stencil frame. Because the USC400 is highly portable, it can be easily moved between work areas or stencil printing systems. This highly efficient system gives versatility to your stencil cleaning process. Most effective process. Direct contact ultrasonic cleaning is the most effective way to remove lead free solder paste residues from fine pitch stencils. This improves process yields, particularly on fine pitch applications. Versatile. The system is suitable for cleaning all printable materials, including pastes, inks, resists and SMD adhesives when using the correct solvent for each. Cost effective. The process ensures minimal use of cleaning fluids. Therefore, there are lower costs in production and less VOC’s. Superior technology. Advanced transducer auto-tuning system gives optimum cleaning performance on all applications however the pressure is applied to the head. Other systems sub-modulate the output causing damaging vibration. Flexible system. The system is suitable for both offline and on printer cleaning operations. The system is portable and can be easily moved between work areas or printers. In-situ cleaning. Stencil cleaning can be carried out on the printer without removing the stencil frame by placing a cleaning pad under the stencil and clearing the blockage with the hand tool. Compatible. Suitable for all stencil materials including plastic. No risk of damage to delicate Stencils. Simple operation. The system requires no operator setting. Multi-use. An optional ultrasonic mini-bath is available which extends the versatility by allowing cleaning of machine accessories such as placement nozzles, glue dispensing needles and test probes etc. Safe to use. The system uses low voltage, high efficiency transducer drive circuitry. This means it conforms fully to the EU Machinery directive. Light weight and robust. The system is easily transported for workplace portability and is a rugged industrial construction for long service life. An optional ultrasonic mini bath is available which extends the versatility by allowing cleaning of machine accessories such as placement nozzles, glue dispensing needles and test probes etc. 120/230 VAC 50/60Hz @ 5/2.5 amps. Power output at 40KHz- @ 40 watts.